Sunflower Stamper: Gotta Love it!! This is a "warning label" that Stampin' Up! 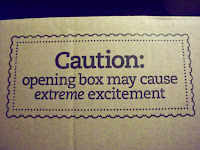 has added to the largest shipping boxes right now for Sale-A-Bration! Don't ya love it???? Way cool. All of you NEED to book a workshop during SAB so that you can receive these GREAT boxes!!! Contact me TODAY to book your workshop! !